Shower rod lengths measuring less then 100"
If you would like to add a message along with your order, (e.g. : I would like actual curtain measurement to be 72" wide by 83" long.) you may do so below. These fabric shower curtain are made of the highest quality polyester material. The 100% polyester fabric is woven with 150 denier thread and a 64 x 56 count. All of the polyester fabrics have a waterproof teflon finish but are soft and supple. The shower curtain liners are the quality used in fine hotels. All shower curtains are constructed with a reinforced triple folded header, 1⅜ inches wide, reinforced with a strip of no-tear buckram, and have metal rust proof grommets. Side hems are ½ inch wide, double folded. Bottom hems contain a heavy chain weight, covered with a mildew resistant material, which is stitched in to the bottom of the hem. The bottom hems are reversed to enhance the flowing off of soap and water. The Dynasty has a white on white plaid pattern and is available only in white. 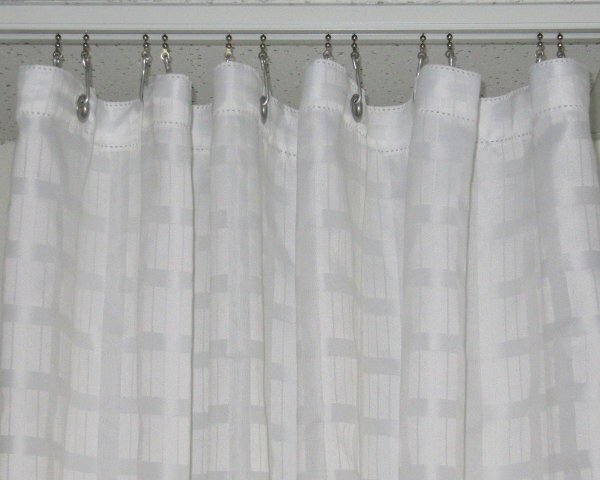 The shower curtain liners clean easily with soap and water. They can be machine washed with the gentle cycle using mild detergent and no bleach. The liners can be line or tumble dried on a low setting.